Can you produce the design and file for me? We certainly can. The more detail you can provide as to what you have in mind the better. Design work starts with a deposit of $100 which covers the first hour of work and at least one round of drafts. If more work is required time is billed at $100 per hour in 10 minute increments. For digital printing we prefer an 100# bright white and warm white uncoated cover. There are also other options available such as thicker paper, gloss, and matte coated paper. The 100# uncoated makes a very nice dust cover and while you can go with something thicker we don’t think the additional expense gains you very much when going with digital printing. For letterpress printing our preferred sheet is 92# Savoy Brilliant White Cover. Savoy shows letterpress printing very nicely. Again, we have several thicker options in the Savoy (118#, 184# and 236# cover weights) but the most popular option is the 92#. Please contact us should you desire paper samples. Our prices are based on your print-ready electronic file. PDF’s are the preferred format. Print-ready files should always include bleed image (if any is used), embedded fonts, crop marks indicating outside dimensions (i.e. 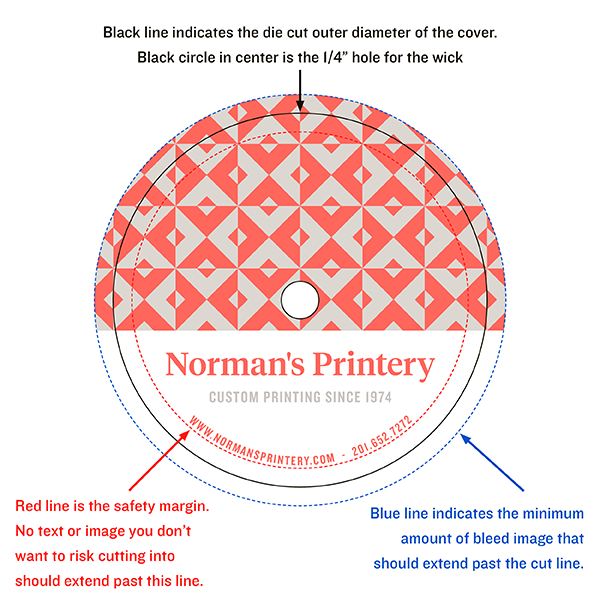 a 3” diameter cover would show a square image 3” x 3” with crop marks) and if printing letterpress, image should be in the color desired in 100% Spot Pantone Uncoated ink or solid black also @ 100%. If art is in black and you wish to print the order in a color we can do that – just be sure to clearly indicate what the ink color should be along with your order – otherwise it will get printed in black. Possibly. Contact us with details and we can let you know what’s doable and if there will be additional cost for the faster service. Bear in mind that we are located in Wyckoff, NJ which is about 25 miles outside of New York City when you figure in shipping time. From approval of the proof we provide, most orders are produced in 5 to 7 working days. Larger orders or orders made up of many smaller lots may require 10 working days but most of the time we ship in the 5 to 7 working day window. To a certain degree, yes you can! 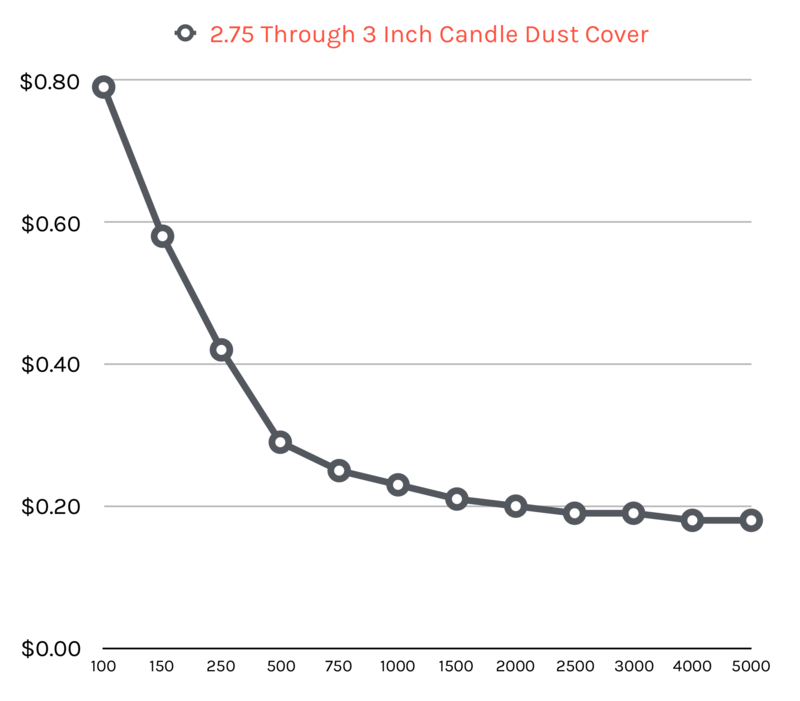 There are some limitations depending on the size of cover you are ordering, total quantity desired and the type of process being used (letterpress vs digital). Contact us with what you have in mind and we can guide you as to what makes the most sense cost-wise. There may be a nominal additional cost for us to do this but it’s still a great way to get more than one lot printed. Another interesting option might be to print a common image such as your logo in letterpress, but have the variable information (such as scent) imprinted digitally. Or you can print something like a water color illustration using digital and print other information letterpress right on top of the color illustration. Lots of options are available! What’s the difference between Letterpress Printing and Digital Printing? Letterpress printing produces a beautiful indented image. It’s very tactile. Vector art is the best type of image to print letterpress (think type, line illustrations – definitely not photographic images). Because of the process that is involved to print letterpress, printing in 1 color is the most cost effective method. More than 1 color may be printed but of course that increases the cost. Contact us for pricing if you would like to do more than 1 color. Digital printing produces a flat image but allows for virtually any type of image including photos, tints – whatever you like. Full color is not a problem either. In small quantities it is very cost effective. As a matter of fact we offer as few as 100 covers in digital printing! We understand that keeping costs down is one of your top priorities. See the sample chart below illustrating how buying larger quantities can dramatically reduce your price per unit. Our custom made templates will help ensure your design is print ready and eliminate unpleasant surprises in production. Find the size of your cover below and click to download the PDF template. We recommend using a design program that has a "layers" feature. Place the template on a layer above your art and lock it. You will then be able to arrange your art while seeing exactly where the cut line, bleed line, and safety lines are. When you are ready to send us your art, turn off the template layer and export or save to a Press Quality PDF (or equivalent).